Canons L-series line of Tilt-Shift / Macro lenses offer incredible versatility while delivering pristine optics. 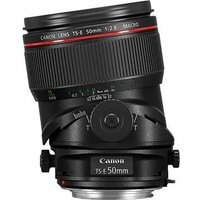 The 50mm prime lens from this series boasts exceptional edge-to-edge definition, macro down to 1:2, and a minimum focus distance of just 27.5cm (with a working distance of just 12.5cm). Capture fine detail, maximise depth-of-field, and get up close with this flexible lens.